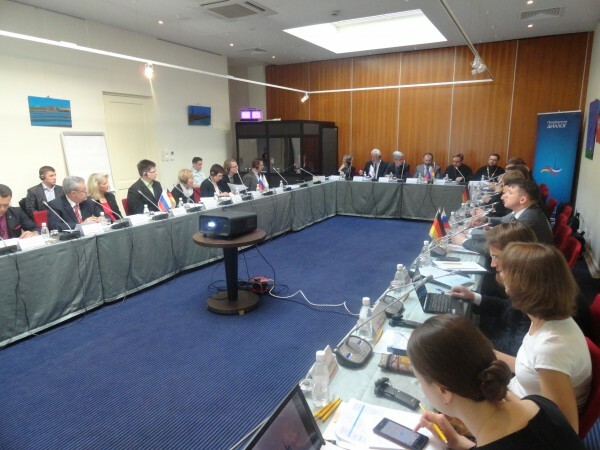 On June 5, 2014, the Churches in Europe working group of the St. Petersburg Dialogue, a forum of civil societies in Russia and Germany, met in St. Petersburg to discuss the theme “Understanding of Religious Freedom in the Democratic Society”. The Russian Orthodox Church delegation included Archimandrite Philaret (Boulekov), a vice-chairman of the Moscow Patriarchate’s department for external church relations and co-chairman of the Churches in Europe working group; Archpriest Sergiy Zvonarev, DECR secretary for the far-abroad; Rev. Ilya Kosykh, head of the DECR communication service; V. Kipshidze, head of the Synodal information department’s analytical section; V. Kuznetsov of the DECR communication service; O. Mazur and S. Ochkanov, of the DECR secretariat for the far abroad. Participating in the meeting were also Archpriest Alexy Isaev, head of the St. Petersburg diocesan department for church-society relations, Rev. Alexy Volchkov, head of the St. Petersburg diocesan press service, A. Maler of the Synodal Biblical and Theological Commission, and V. Zavalny of the St. Petersburg diocesan protocol section. The German side was represented by Dr. J. Oldemann, director of the Johann Adam Möhler Ecumenical Institute and co-chairman of the Churches in Europe working group, Probst S. Kasparik, reformation and ecumenism officer in the Evangelical Church in Central Germany, Prof. Dr. E. Schockenhoff, Freiburg University; Dr. Ch. Rebenstorf, Social Sciences Institute of the Evangelical Church in Germany; and others. The meeting was co-chaired by V. Kipshidze and Dr. J. Oldemann. Papers were read by V. Kuznetsov on “Religious freedom in the Russian Federation’s constitutional legal doctrine, A. Maler on “The Christian foundations of the European identity”, Dr. Rebenstorf on “Religion and democracy: Expectations of democratic societies from the Church and religion”, Dr. Schockenhoff on “The right to a free and unimpeded search for the truth. Religious freedom and secular state”. The meeting discussed the legal regulation of religious freedom in Russia and German today, problems involved in implementing freedom of religion in the public space and relationships between freedom of faith and the democratic public order. The St. Petersburg Dialogue is a forum of the civil societies in Russia and Germany. Established in 2001 at the initiative of Russian President V. Putin and German Chancellor G. Schroeder, it is called to promote mutual understanding between Germany and Russia and comprehensive bilateral cooperation. It consists of 100-150 participants from each side. They represent various issue groups. The Churches in Europe working group is the “youngest” unit in the Dialogue’s structure. It first met in 2007 in Wiesbaden. It includes representatives of Christian confessions in Russia and Germany.